Figure 1: Likely top-down cracking on I-37 south of San Antonio, TX. 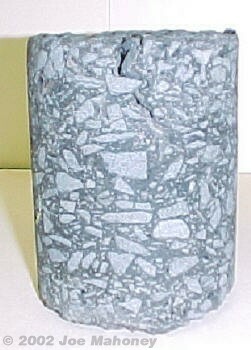 Age hardening of the asphalt binder resulting in high thermal stresses in the HMA (most likely a cause of the observed transverse cracks). 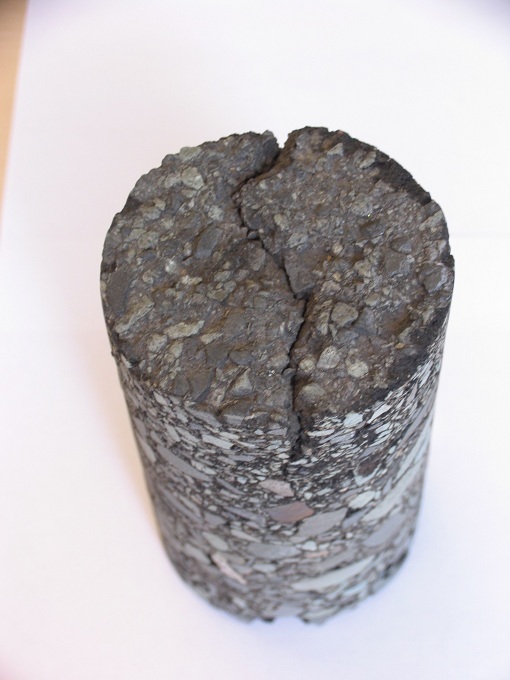 Figure 2: Top-down cracking in a 7-inch core taken from Makakilo Dr. on Oahu, HI. Figure 3: Same core, different angle to more clearly see the crack. Likely, the mechanism is some combination of the above. The bottom line is that HMA top-down cracking is not thoroughly understood and, at this time, is generally not considered as a causative factor for pavement cracking although it probably should be. Further, for two states that recently studied cracking origins (Florida and Washington State), both reported that top-down cracking is far more common than assumed. In fact, the Florida DOT reports that top-down cracking is dominant for their HMA pavements due for rehabilitation. Currently, the National Cooperative Highway Research Program (NCHRP) is addressing the issue with Project 01-42: Identification of the Design Conditions and Critical Factors That Are Related to the Top Down Fatigue Cracking Mechanism. Two simple suggestions may help in the identification of top-down cracking. First, in thick HMA pavements, consider top-down cracking as a possible cracking mechanism. Generally, previous research has found that in pavements thicker than about 160 mm (6.3 inches) top-down cracks can be and often are the dominant form of cracking. Do not assume pavement cracks are bottom-up. Second, before deciding on a maintenance and/or rehabilitation strategy, take a pavement core on a suspect crack (see Figure 2). Usually, a pavement core will show whether a crack is top-down or bottom-up. It will also show the extend to which the crack has propagated, thus defining the extend of needed milling prior to overlay. Often, if top-down cracking is caught early enough a repair strategy of milling off the cracked layer of HMA and replacing it with a new layer can essentially restore the pavement to a like-new condition. This is an essential premise of Perpetual Pavements. France. Top-down cracks form within 3-5 years of paving. United Kingdom. Top-down cracks form within 10 years of paving on AC thicknesses of 180 mm or more. Netherlands. Top-down cracks common for AC thicknesses of 160 mm or greater. Japan. Top-down cracks commonly observed and occur within 1-5 years of paving. California. Analysis showed that top-down cracks could form due to truck tire edge stresses that produce high surface tensile strains. Washington State. Top-down cracks form within 3-8 years of paving on AC thicknesses of 160 mm or greater. Florida. Top-down cracks form within 5-10 years of paving on a wide range of AC thicknesses. Gerritsen et al. (1987) reported that pavements in the Netherlands were experiencing premature cracking in the wearing courses. Further, the cracks did not extend into the intermediate/binder course. These surface cracks occurred both inside and outside the wheelpath areas, and, in some cases, soon after paving. This caused Gerritsen et al. to conclude that there was likely more than one causative effect. The surface cracking outside of the wheelpaths had low mix strength characteristics at low temperatures. Further, they noted low binder penetration values could be related to higher thermal stresses. The surface cracks in the wheelpath areas were largely attributed to radial shear forces under truck tires near the tire edges. Their conclusion was that both thermal and load related effects caused the observed surface cracking. They recommended that the binder film thicknesses be increased to reduce early age hardening of the mixes. Dauzats et al. (1987) also published results that described surface initiated cracking on pavements in France. They noted that the cracks could be either longitudinal or transverse and occurred typically three to five years following construction. They estimated that these types of cracks were initially caused by thermal stresses and then further propagated by traffic loads. It was noted that a rapid hardening of the asphalt binder likely contributed to this type of pavement distress. Work reported by Matsuno and Nishizawa (1992) noted that longitudinal surface initiated cracking of the HMA wearing course was commonly observed in Japan about one to five years following construction. Their observations and analyses are of special interest. First, they observed that the longitudinal cracks did not extend under overpasses (shaded areas). Second, analysis of FEM results showed that very high tensile strains occur at the edge of truck tires at or near the surface of the HMA wearing course. These high strains occur when the upper portion of the HMA is at a low stiffness due to high surface temperatures. They also noted that if the HMA is not hardened due to aging effects, the small cracks that form are eliminated by the kneading action of tires. This changes as the HMA ages. They analyzed two thicknesses of HMA: 200 mm (8 inches) on heavy traffic routes and l00 mm (4 inches) on light traffic routes. For both thickness cases using a peak surface temperature of 60°C (140°F) (decreasing with depth) and associated stiffness of about 200 MPa (29,000 psi) at 60ºC (140°F), they reported similar tensile strains of over 1400×10-6 mm/mm (inch/inch) near the pavement surface. Thus, they concluded that HMA thickness is not a major factor with this type of cracking. A study on large transport vehicles and their effects on pavements was reported by Craus et al. (1994) in work done for the California Department of Transportation. Their analyses showed that large tensile strains occur at the top of the HMA wearing courses. Specifically, these strains are due to high tire edge stresses for conditions where the upper HMA is at a low stiffness due to high surface temperatures (stiffness ratios of less than 0.5 produced the largest tensile strains). It is of special interest that the California and Japanese studies drew the same conclusions concerning the cause of surface initiated cracking. More recently, Nunn (1998) reported that surface initiated cracking was common on UK motorways. Typically, these surface cracks were observed about 10 years after paving. Nunn noted that for pavements with HMA thicknesses exceeding 180 mm (7 inches), there was no evidence of fatigue cracking in the lower intermediate/binder course, only the wearing courses. Additionally, he showed that there was a discontinuous relationship between the rate of rutting and the thickness of the HMA layers. For combined HMA thicknesses greater than 170 mm (6.7 inches), the rutting rates on about 50 pavement sections were about 200 times less than for HMA layers with thicknesses less than 170 mm (6.7 inches). For sections with less than 170 mm (6.7 inches) of HMA the rutting rates were about 100 mm (1 inch) per million ESALs and 0.4 mm (0.016 inches) per million ESALs for greater than 170 mm (6.7 inches). Such dramatic measurements suggest that a very different distress mechanism occurs at the “breakpoint” thickness. Nunn also summarized recent work performed in the Netherlands that showed for HMA thicknesses exceeding 160 mm (6.3 inches), cracks initiated at the pavement surface and eventually penetrated to a depth of about 100 mm (1 inch). He also noted that the Netherlands work indicated for full depth cracks in thinner pavements that the cracks propagated from the top of the pavement surface downward. Nunn showed that the surface initiated cracking in the UK could be either longitudinal or transverse. The transverse cracks were related to low binder penetration values (typically about 15). He also stated that the pavement sections with and without surface cracking had no significant difference in measured deflections. He concluded the cause of the surface initiated cracking was due to horizontal tensile stresses generated by truck tires at the HMA surface. Wide based tires generated the highest tensile stresses. Myers et al. (1998) reported that surface initiated cracking in Florida was found to represent 90 percent of the observed cracking in pavements scheduled for rehabilitation. Thus, this type of cracking predominates in Florida. They noted that this type of cracking is generally observed on pavements five to ten years following construction. The HMA thicknesses in their study ranged from 50 to 200 mm (2 to 8 inches). The cracks were most often longitudinal with surface crack widths of about 3 to 4 mm (0.12 to 0.16 inches) decreasing with depth. The total crack depths ranged from about 25 mm (1 inch) to the full depth of the HMA layer. Based on computer modeling, it was concluded that tensile stresses under the treads of the tire – not the tire edges – were the primarily cause of the cracks. Further, wide base tires caused the highest tensile stresses. They noted that the tensile stresses dissipate quickly with depth suggesting that this might be the reason the cracks essentially stop growing; however, they felt this needed further investigation. They concluded that surface initiated cracking is not a structural design issue but more related to mixture composition. Specifically, they concluded that more fracture resistant asphalt mixes are needed. At the January 2000 TRB Annual Meeting, Uhlmeyer et al. reported that top-down cracking is common to thicker Washington State DOT HMA surfaced pavements (top-down cracking was typically observed when the average HMA thickness was about 160 mm (6.3 inches) or greater). Such cracks were generally contained in the wearing course and averaged 46 mm (1.8 inches) in depth. The top-down cracks generally initiated within three to eight years of paving. No hypothesis as to cause was made. Dauzats, M. and Rampal, A. (1987). Mechanism of Surface Cracking in Wearing Courses. Proceedings, 6th International Conference Structural Design of Asphalt Pavements, The University of Michigan, Ann Arbor, Michigan, July 1987, pp. 232-247. Gerritsen, A.H.; van Gurp, C.A.P.M. ; van der Heide, J.P.J. ; Molenaar, A.A.A. and Pronk, A.C. (1987). Prediction and Prevention of Surface Cracking in Asphaltic Pavements. Proceedings, 6th International Conference Structural Design of Asphalt Pavements, The University of Michigan. Ann Arbor, Michigan, July 1987, pp. 378-391. Matsuno, S., and Nishizawa, T. (1992). Mechanism of Longitudinal Surface Cracking in Asphalt Pavement. Proceedings, Volume 2, 7th International Conference on Asphalt Pavements, The University of Nottingham, pp. 277-291. Craus, J.; Chen, A.; Sousa, J. and Monismith, C. (1994). Development of Failure Curves and Investigation of Asphalt Concrete Pavement Cracking From Super-Overloaded Vehicles. Report to Division of New Technology, Materials, and Research, California Department of Transportation. Sacramento, CA. De Beer, M.; Fisher, C. and Jootse, F.J. (1997). 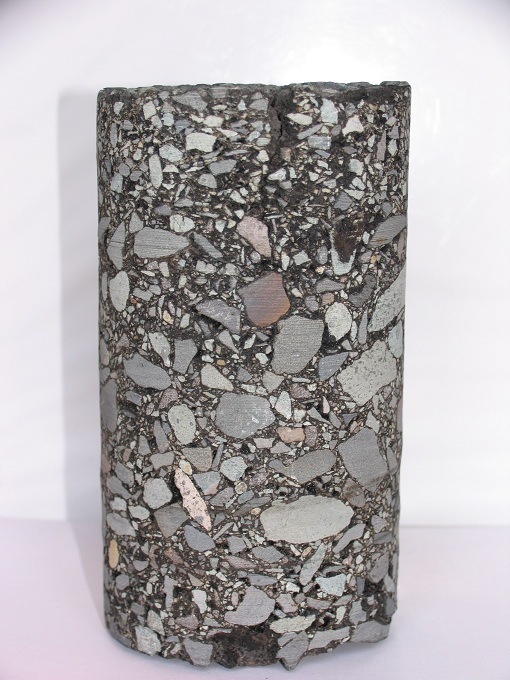 Determination of Pneumatic Tyre/Pavement Interface Contact Stresses Under Moving Loads and Some Effects on Pavements With Thin Asphalt Surfacing Layers. Proceedings, 8th International Conference on Asphalt Pavements, University of Washington, Seattle, Washington, August 1997, pp. 179-227. Himeno, K.; Ikeda, T.; Kamijima, T. and Abe, T. (1997). Distribution of Tire Contact Pressure of Vehicles and Its Influence on Pavement Distress. Proceedings, 8th International Conference on Asphalt Pavements, University of Washington, Seattle, Washington, August 1997, pp. 129-139. Myers, L.A.; Roque, R.; and Ruth B.E. (1998). Mechanisms of Surface-Initiated Longitudinal Wheel Path Cracks in High-Type Bituminous Pavements. Proceedings, Volume 67, Association of Asphalt Paving Technologists. Nunn, M. (1998). Design of Long-Life Roads for Heavy Traffic. Australian Asphalt Pavement Association Industry Conference. Surfers Paradise, Queensland, Australia. Uhlmeyer, J.S. ; Willoughby, K.; Pierce, L.M. and Mahoney, J.P. (2000). Top-Down Cracking in Washington State Asphalt Concrete Wearing Courses. Transportation Research Record 1730. Transportation Research Board, National Research Council, Washington, D.C. pp. 110-116.